A sample of the locations in the new set. I have been an unabashed fan of this game since the original PACG base set, Rise of the Runelords, was released last August. It provides me that thing I don't have time for nowadays, that feel of an RPG without having the multiple weeks of sitting down with a character sheet and an eight or ten hour gaming session. While there are people who don't like the simplicity of PACG, I find that every turn I take with a character is a short story ready to be told. The time I, as my cleric, fought a bunyip at the Abandoned Farmstead and lost. The last minute closing of the Desecrated Temple before my companion (aka my wife) defeated Blackfang. Its all there, albeit in compressed form. The newest base set, Skulls and Shackles, begins a whole new campaign set in a set of islands known simply as The Shackles with the players as the crew of a simple merchantman. The base set has five scenarios that form the introductory adventure, and then has the first Adventure Deck, The Wormwood Mutiny, in the box ready for you to play. There is a lot to say about what is new with this set. First and foremost, the majority of the Boon cards have been reworked. As evidenced by the spell card on the left, they have done a lot to add some visual flair at the top and borders. Also, instead of having a separate 'recharge' box at the bottom, the text is just included in the instructions on the card. I've looked through the other five hundred cards that came in this set and it is clear they have cleaned up some of the mechanics and language that cause a problem with a couple of cards in the original set. This is not to say that there is a new learning curve if you played Rise of the Runelords. Other than some wording on how encounters with enemies work, the basic framework of the game is the same. The various scenarios do change up the formula of find henchman, beat henchman, close location, beat villain a little bit. The basic formula is still in play here, but it looks like they tried to spice it up with other ideas. One of the introductory adventures, Rum Punch, has you being captured during a festival by a smuggler known as Nefti Unwesha. As you find allies in the various location decks and aquire them they don't go into your deck but a separate side deck. When you finally confront Nefti, you can draw on as many of those allies as you wish to help defeat her. The downside to making use of the side deck is the final reward 'Acquire any allies in the ally deck'. So do you fight with the mob and then let them go their own way, having paid their debt to you? Or do you show your stuff as a pirate captain with them just watching, and have them join your crew once you win? The game has a few familiar faces as the seven base characters and adds some new ones as well. Valeros, Lem, and Merisiel return with different skills and advanced classes to try out, while we get a gunslinger, a magus, a swashbuckler, and an oracle to try new with the set. You are certainly not limited to these characters. You can use the eleven characters that came with Rise of the Runelords if you would like, but you have to use them as completely starting characters. So if you liked the advanced class that Merisiel had in RotR, you have to use all her character cards from that set. You cannot use her advanced card from one set and character card from the other. I think the part that will confuse most players is that you don't get to keep all your upgrades or nice gear from having completed the full RotR campaign. Sadly, an advanced campaign has not yet been announced. Alongside this release are several decks labeled 'Class Decks'. 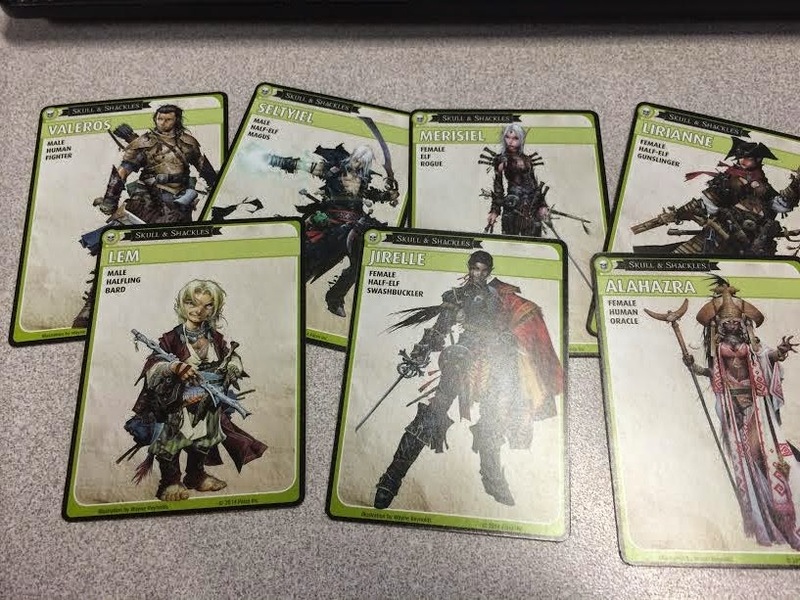 These decks are new character options for a specific class, including advanced classes, as well as enough cards to be used in Paizo's new Organized Play program. You register your character on their website and track it as you attend Organized Play sessions at your local game store and play through the Skulls and Shackles campaign. The class deck provides you enough cards so that once the session is done, you can give the owner of the base set all of his cards back and still have a complete deck to play in a different session. I'll have more on these class decks as they release. It sounds like a really nifty process of extending their Organized Play program. There is a lot here to like. They have taken everything that made Rise of the Runelords a great cooperative adventure game, changed the theme, and given us more adventures to experience. I will readily admit that if you didn't like the basic formula of the game and felt it just boiled down to flip card, move, explore, roll dice, repeat, well... you aren't going to find much new here. I think that if that is all you are finding in the game, then you may be missing the opportunity to tell a great story or two in an evening. Looking through at the redesigned cards I really can't wait to get my hands on the Add-on Character pack and the other adventure decks for Skulls and Shackles. Paizo has brought another of their great pencil and paper RPG storylines to the PACG setting and I'm ready for it. The high seas await us all!